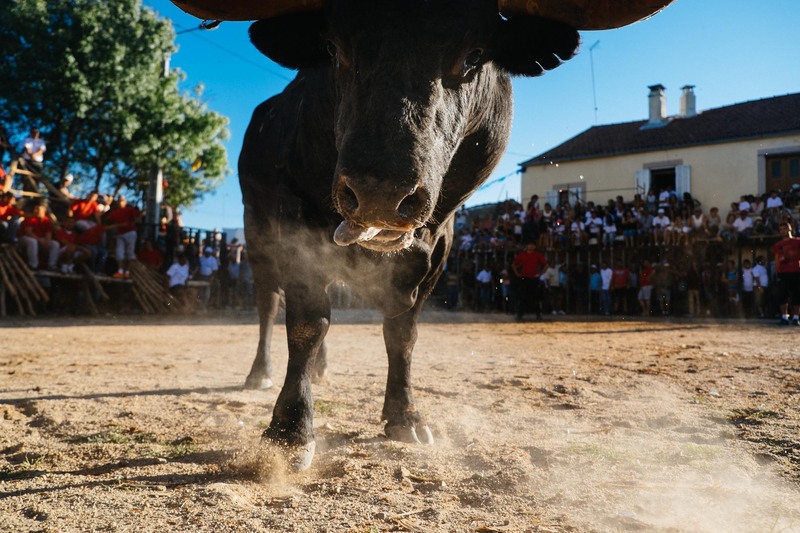 Back in the summer of 2014 I travelled with a photographer friend, Mitchell Kanashkevich, to some of the villages of the Sabugal municipality, in the Beira Interiore Norte region of Portugal, close to the border with Spain, to photograph a traditional and lesser known bullfight called capeia arraiana. The adjective “arraiana” comes from the term “raia”, a byname that is used to define the border that divides Portugal from Spain. 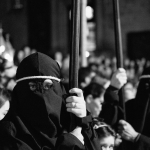 Far from being just a game, the capeia arraiana has an important social significance within the local communities, and it’s a strong component of the cultural identity of this part of the raia. Special thanks to Portuguese photographer Rui Pires who tipped Mitchell off about this tradition and met up with us on the last couple of days of the trip. When Mitchell’s Land Rover breaks into the main square of the village, relatively early in the morning, Aldeia do Bispo is already awake and fairly busy with the preparation for the big event. A man is laying a large amount of chickens on a giant barbecue. 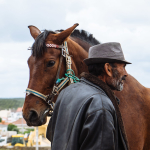 I jump out of the car and approach him – “Hi there, do you know where are the horses, by any chance?”, he replies in Spanish, using one or two Portuguese words (we’re just a couple of kilometers from the border with Spain). 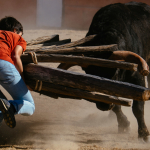 He won’t be of much help since he doesn’t know where the encerro, the rounding-up of the bulls, is going to take place. It takes a few people, including a funny half-drunk guy I spoke with at the local bar (he promised me he’d get us there, but then he disappeared! ), before I can extrapolate some useful information. “Anda cà – a guy finally says – se me der uma caneta e um papel eu faço um boneco“, if you give me a pen and a piece of paper I’ll make a drawing for you (Well, not quite, boneco means doll, or cartoon, but I get the idea). Mitchell detaches the soyuz (a Piaggio scooter he’d been carrying around on a trailer) from the mothership (the Land Rover). Helmets worn, boneco in my hand, and off we go. When we arrive at the place, a dirt road in the middle of the countryside, we start to scout the location. What’s supposed to happen shortly is, a bunch of brave cavaleiros (horsemen) will emerge from a brown dust of cloud in the distance. 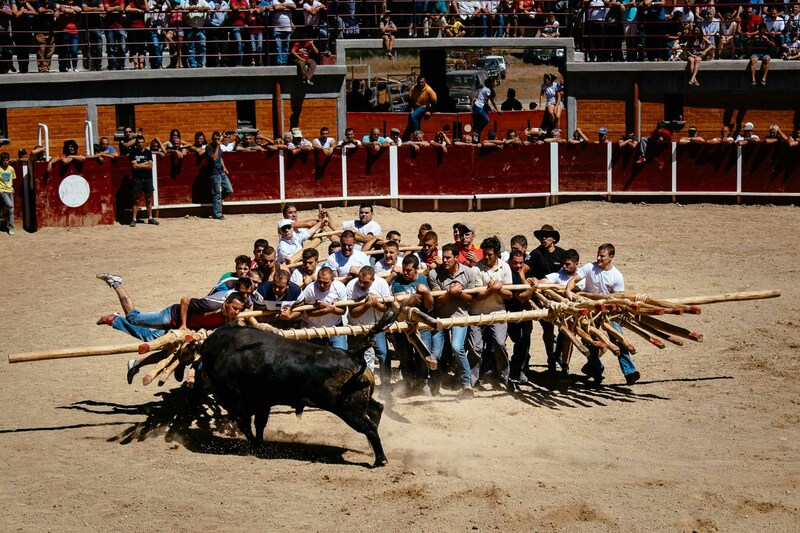 Cows and raging bulls, touros bravos, will be in the middle, enclosed, rounded-up by the horses. 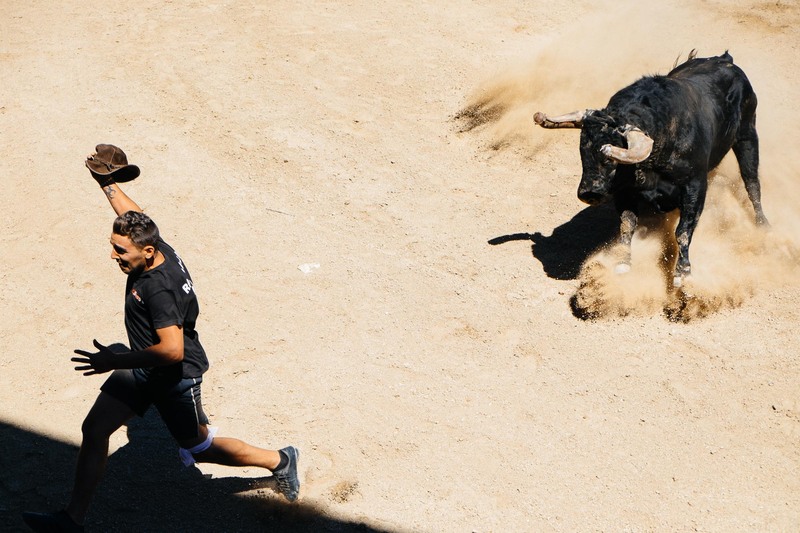 Accounts of bulls breaking the encerro and running away to chase spectators are not unheard of. Because I don’t have a strong enough reason to risk my life yet, I’m relieved when I see there’s no shortage of fairly safe vantage points all around. Mitchell, camera in hand, chose his vantage point and sat down waiting for the horses to appear in the distance. Suddenly the brown dust cloud appears in the distance, it all feels like a spaghetti western movie (Ennio Morricone playing in my head), except we’re in Portugal, and therefore what should I call it? A bacalhau western? 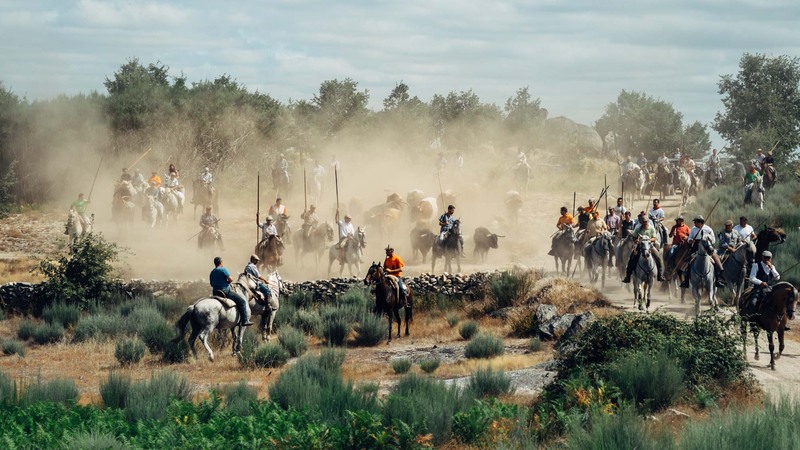 The events unfold pretty fast and before touros and cavaleiros get out of sight, without thinking twice, we begin to run behind the countryside-style dry stone wall that separates us from the danger, camera in hand, chasing the shot. When automated means of transportation weren’t easily available, the locals had no other way to take the bulls to the village for the games. Villagers would ride horseback to the farm or corral where the bulls were held, and, with the help of cows and steers, would lure the bulls into following them. 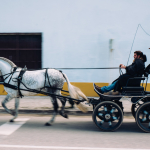 In the modern world the cattle can be safely transferred with trucks, but some villages made a commitment to keep the tradition alive by re-enacting what happened back in the day. 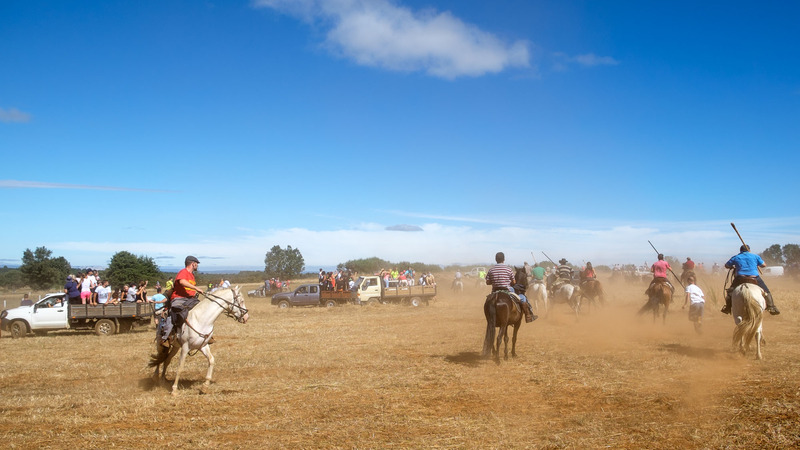 In this context, modern encerros, with the parade of 4X4s, motorbikes, and other countryside-friendly vehicles taking part in it, have become an opening ceremony, an entertaining show to perform at the beginning of a day of capeia. Forget toureiros and bandarilheiros harming and killing the poor animal. 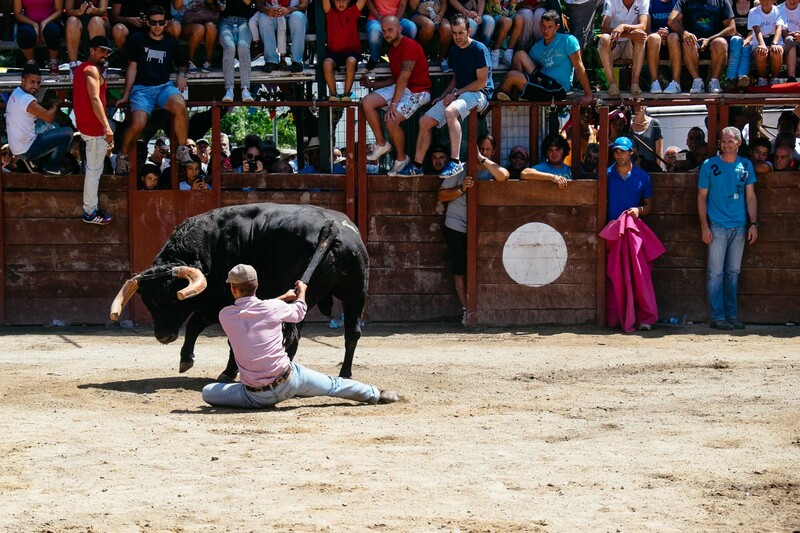 The capeia is a different show – a team of about 30 people holding a 300 Kg triangular wooden structure (the Forcão, which resembles what could be the end of a big fork) faces a raging bull, and tries to resist its charges. Between or during the various runs of capeia, spectators can jump into the enclosure, mess around with the beast and show off their bravery. 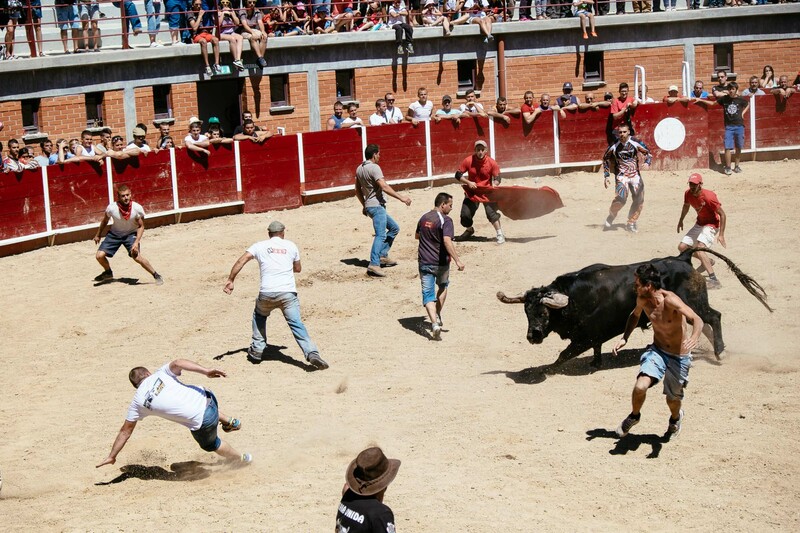 The bulls do get harassed here, but they don’t have to undergo any serious physical torture in order to “serve” the games, making this form of tauromachy relatively incruent. Expectedly, people get injured more than bulls during these festivals. 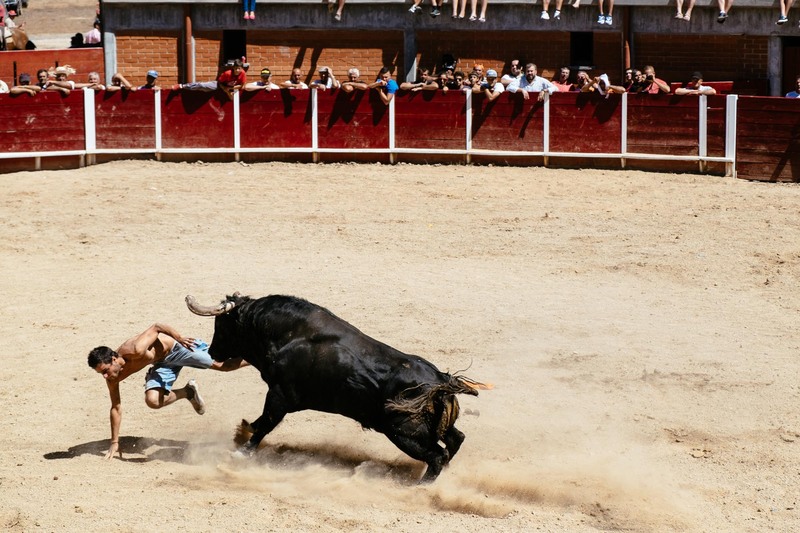 Soon after the encerro, Mitchell and I ride the soyuz back to the makeshift bullfight place in Aldeia do Bispo – only a couple of villages in the municipality have built proper arenas, all the others host these games in enclosures set up in the largo, the main square. The place is packed. The air is filled with smell of frango assado, grilled chicken, coming from the giant barbecues all around. The atmosphere is that of a reunion among old friends. 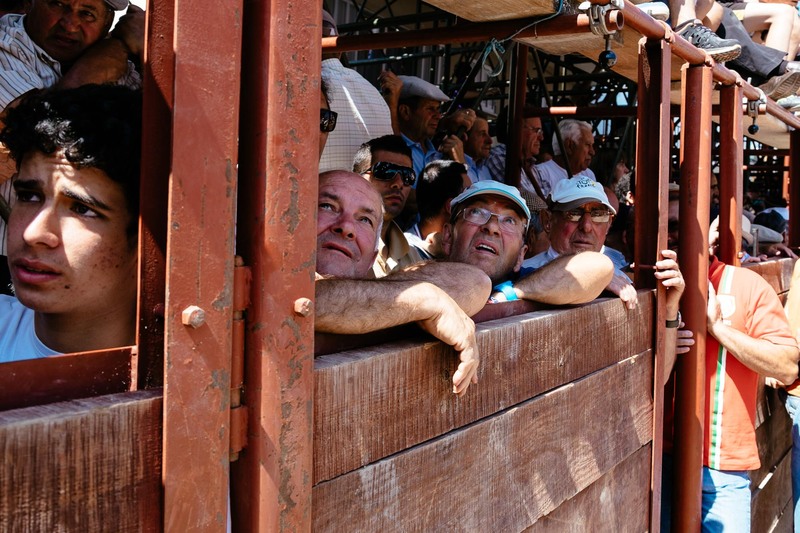 In an area that has a high emigration rate, with so many locals living permanently abroad, mostly in France, or in other economically dynamic parts of Portugal, August, the month of capeia, is not coincidentally the time of the year when the emigrantes come together to their birthplace to spend quality time with their extended family and their friends. 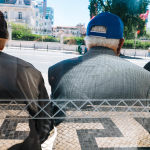 Because due to the emigration the population is ageing rapidly, it’ll be interesting to see, one generation from now, the tradition being kept alive by boys and girls born and raised far away from Sabugal, perhaps speaking French as their first language. 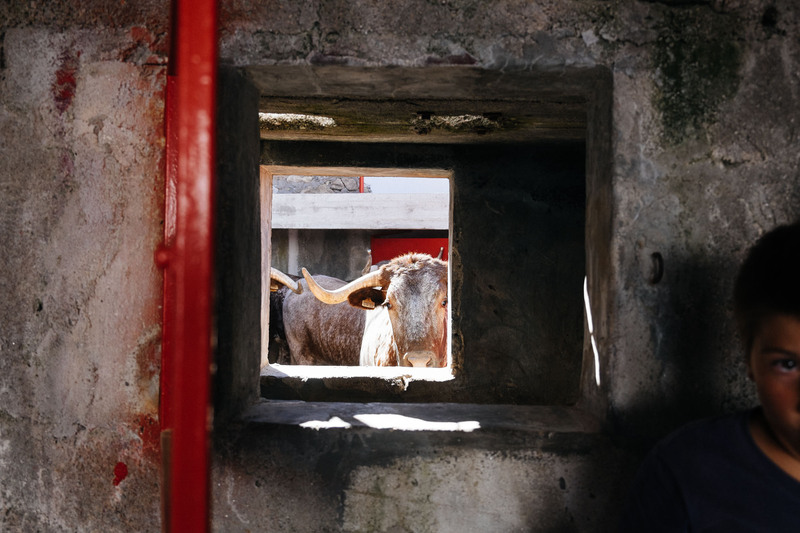 Before the lunch break, the boi da prova, a random bull from the bunch, is released into the enclosure for a run of capeia, to allow spectators and participants to sample the size and the aggressiveness (“the quality”) of the cattle that will entertain them later in the evening. Mitchell and I chose different spots: he climbs onto the top tier, I remain at the ground level. Although messing around with a raging bull is not exactly my idea of fun, it’s great being here trying to capture all this madness on camera. As lunchtime approaches my stomach demands food. I meet again with Mitchell and we go to the Spanish guy at the big barbecue: “Um frango assado por favor“, one grilled chicken, please. He smiles – all the chickens being grilled are sold out already and there’s none left for us to buy. Once again, he won’t be of help. I should have known! I hope you enjoyed the post. Feel free to leave a comment, like it and share it with your friends! 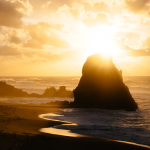 If you want to receive new photo posts, and updates including photography resources, tips and tutorials, enter your email below and join my mailing list. Wow, I’ve made a record! I really like the design of the blog. Great story and great photos! Thank you for dropping by, Dario. Great shot you get 🙂 and i think you get the real spirit of the all thing.